My dreams are coming true easily and effortlessly. My dreams are coming true in perfect timing. My dreams are coming true even if I can’t see the evidence yet. Choose an ending that resonates for you. One that makes you feel good and doesn’t trigger all the gremlins that tell you exactly why the whole idea is preposterous. One that helps you put one foot in front of the other on the path to those dreams. If the gremlins won’t stay quiet, have a conversation with them. Tell them you don’t have to believe them. Cry about it. Write about it. Sing or dance about it. But keep telling them – and yourself – that your dreams are coming true. The dreams might not look exactly as you imagine. They might not be the same dreams you had a year ago, a decade ago, or even yesterday, but (let me repeat myself) you have dreams that are coming true. Use this mantra to relax into trusting that you do enough and that you are enough. 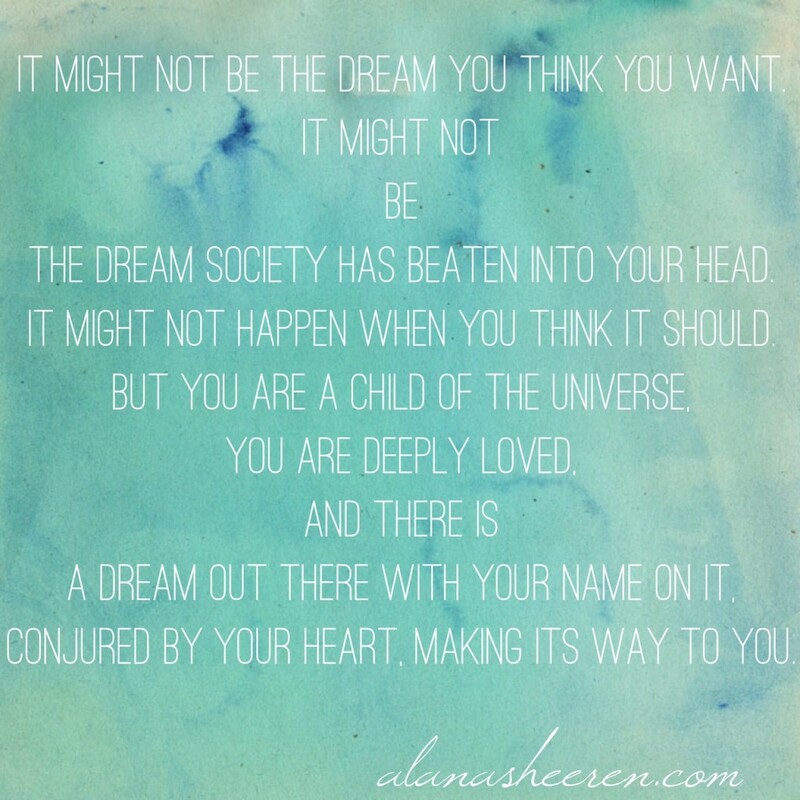 That you are worthy of a dreams-come-true kind of life. Even if it’s a hard one. Even if today makes you want to curl up into a ball and hide. Use this mantra when it feels right. If it triggers pain, or shame, or guilt then file it in a drawer for the day you need it. The day when it helps your body relax and your heart expand even if the house is messy, the bills need to be paid and your to-do list runs off the page. It might not be the dream you think you want. It might not be the dream society has beaten into your head. It might not happen when you think it should. Making it’s way to you. If you doubt this, make a list of every dream of yours – big or small – that has ever come true. Even if there is one thing on your list, that’s proof. So beautiful, your dreams are coming true. What do you need to do to get ready? This is lovely and just what I needed to read tonight…thank you. You fill me with hope. Holding wishes gently, ~smile~ I like that a lot! Thanks for this bright light in my in box!